Last week, strange images of a river that had turned blood red emerged out of Russia. Now satellite images show that the red waters run much further through the area—and it’s been happening for decades. NASA’s Earth Observatory just released pictures that show the river waters in Norilsk, Russia running red far around a local nickel factory. But the top image didn’t come from last week. It’s from fifteen years ago in 2001. 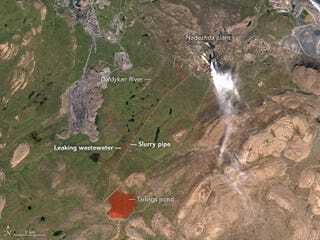 Just like in 2001, the latest satellite picture shows something red flowing in the Daldykan River. But the color is even deeper around the factory’s slurry pipe and especially the tailings pond, a reservoir for mining waste. The Norilsk Nickel factory has been operating since 1979 and satellite images going back to 1997 show the waters turning red multiple times over the last two decades. This confirms observations from both local residents, who said that they had seen the river turn red before, and researchers who visited the area back then. When the latest pictures showed up last week, Norilsk Nickel claimed that the red color of the river had nothing to do with pollution from their plant. But a few days ago, the BBC reported that the company admitted that a filtration dam at the factory had overflown into the river after heavy rain, just shortly before the red river started popping up all over Instagram. Russia’s Ministry of Natural Resources and Ecology says that it suspects the problem may actually be leaks in the factory’s slurry pipe (which you can see in the satellite images surrounded by ominous red) and has launched its own investigation.